When Universal Pictures needed someone to construct a rustic log cabin on location for an adventure drama in the spring of 1979, they contacted a skilled log home builder named Ed Campbell. Intrigued, Ed agreed to take on the job and reported to Fort McMurray with a crew member named Mike. “The Silence of the North” (Ellen Burstyn, Tom Skerritt) is based on the true pioneer story of Olive Fredrickson and her struggle for survival in the far north with a dreamer for a husband and little else. Ultimately widowed with three children, the movie showcases her remarkable courage and determination. On the afternoon of their arrival in the small town of Fort Mac, Ed and Mike met with art director Bill Brodie where they learned that their meals and accommodations would be paid for. After a fine dinner on the studio’s tab they agreed to meet later for further directions and were given a startling expense bonus of four hundred dollars each. At the job site the next morning on the shores of the Athabasca River, Ed and Mike were presented with a stack of unpeeled logs, some tar paper and a pile of hay. A few youths were splitting firewood and throwing it into a pile. The ice was still on the river and patches of snow lay scattered on the frozen ground. Their instructions were to build a 10’x12′ cabin with one corner lower than the others, a sagging roof and skewed doors and windows to indicate that it was very old. The corners were to be cut at random lengths with no visible chainsaw marks and the notches were to be flat on flat: similar to dove tail but without angles. It took a few tries to get it right and the art director became increasingly agitated because it seemed like they were taking their time. Focused on the task, Ed snapped back and he and Mike were left to continue on their own under the watch of studio rep Alicia Keywan. Bill returned a few hours later and was delighted to see that they were up five rounds: a realistic “trapper’s cabin” was taking shape. Smiling broadly now, he raved about the talented log builders that he’d hired. It was finished in a couple days, the ridge pole sawed almost in half length ways and “sagged” with the help of a turnbuckle inside. With some stacked firewood the cabin was ready for the art people from Toronto who would paint the ground, some of the fire wood, the log ends and the sash around the door and window to age it instantly. When Ed saw a picture of the building later it looked spectacular: transformed into a typical trappers cabin that had endured 50 years of bitter winters, blistering summers and would continue to serve. Three months later Ed received a call from Alicia asking if he had ever built a log dugout canoe. The answer was no, but he was up for a challenge. 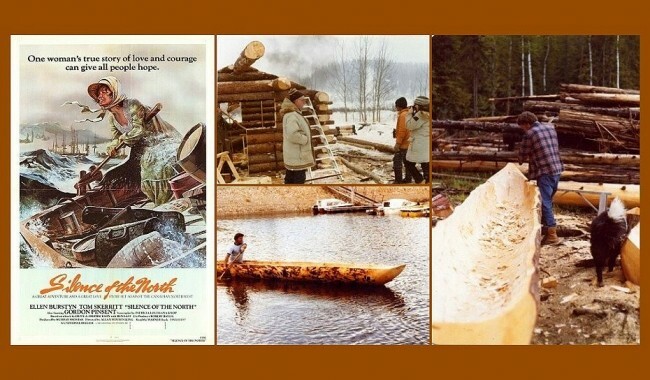 The movie needed a dugout canoe about 21′ long capable of carrying a woman, three kids and a moose. Using a chainsaw, an adze, and various axes it took Ed about a week, a lot of sweat and one trip to the doctor for stitches. The finished canoe weighed about 100 lbs and he was able to load it into the pickup by himself. Alicia put Ed in touch with a Vancouver special effects company, owned by stunt man John Thomas, who was hired to test the canoe–they did not want to drown the actress. Thomas stayed with the Campbell family while he paddled about the Shuswap Lake, concluding that it was indeed safe enough for their needs. He recommended that Ed go to Slave Lake where the film was being shot to spend a few days teaching Ellen Burstyn how to handle the canoe properly. What a dilemma. The canoe building had left Ed a little behind schedule on a log home contract and he didn’t feel that he could spare the time. 35 years later he still shakes his head in regret when he remembers that he had to refuse the opportunity. That was the last he saw of these creations since both remained the property of the studio and were saved for later use. In the end, the cabin that Ed and Mike built is only seen for a few seconds in “The Silence of the North”— a different log structure was sacrificed in a fire scene. The canoe fared better, enjoying some twenty minutes of exposure and plays a significant part in the movie.